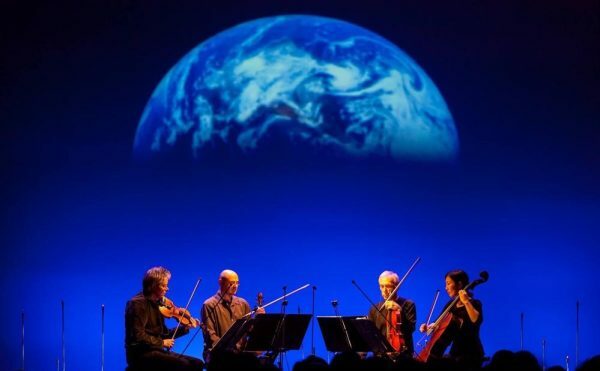 The central thing that distinguishes Chris Martin from his forebears (Forrest Bess, Alfred Jensen, and Simon Gouveneur) is his meshing of visionary symbols and images derived from mass culture, particularly from the world of popular music. He has paid homage to James Brown, “the hardest working man in show business,” in a number of collages and paintings, including, in this exhibition, “Reverend Al in Mourning” (1989 – 2011), which is a large painting made of industrial aluminum foil, which includes a photocopy of a tiny, grainy newspaper photograph of Al Sharpton mourning the legendary singer. The other distinguishing feature is his slyly anarchic humor. (It’s hard to imagine Forrest Bess telling a joke). 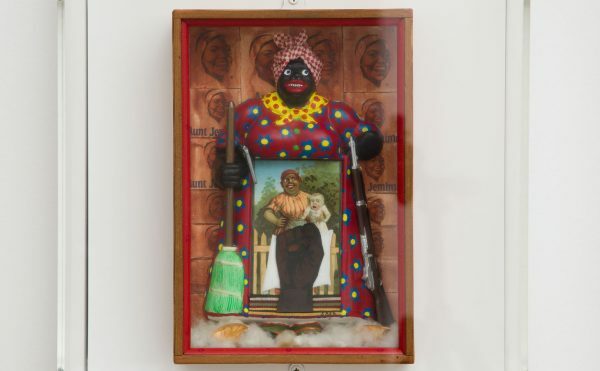 In what is the strongest show since the eye-opening one that he had at Sideshow (2005), Martin placed a pipe smoking, concrete gnome painted red and green in one corner of the gallery. 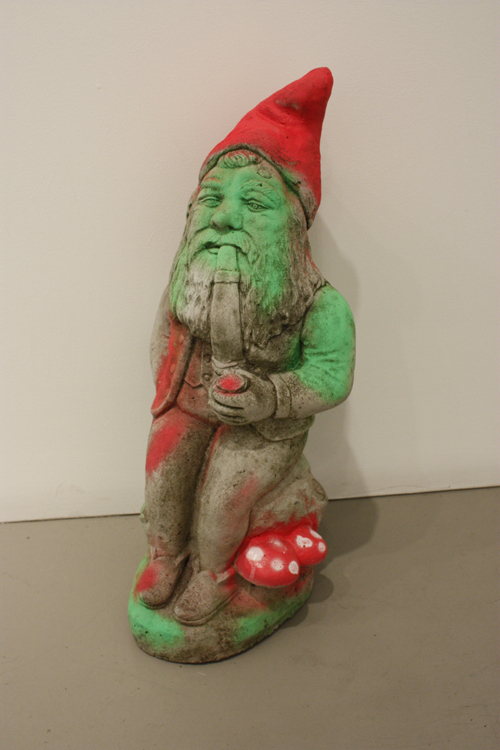 The gnome is the exhibition’s guardian spirit. 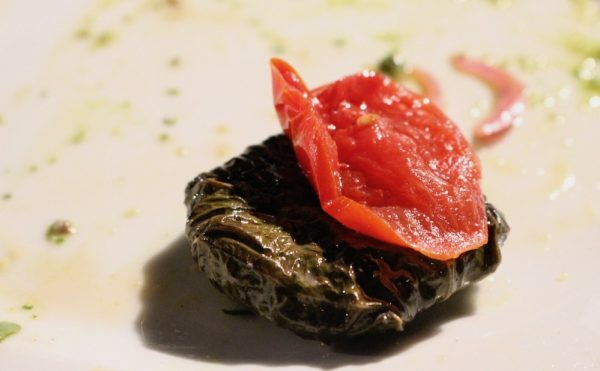 He sits on a rock beside two red mushrooms with white spots — the amanita muscara, which ethnomycologist, bank vice-president and self-published author, R. Gordon Wasson believed was the sacred god/plant responsible for the ecstatic states of dissolution described in the Rigveda, one of the oldest collections of hymns in any Indo-European language. The gnome, according to the alchemist Paracelsus, who coined the word, was a humanoid creature who guarded underground treasures. Martin’s Christmas-colored gnome is guarding the mushrooms as well as smoking something potent. 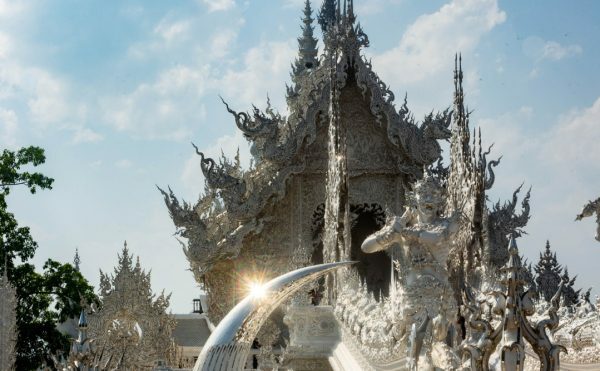 It is easy to see it as a whimsical gesture, which it is, but I also think the humor is an effective way of pointing to something culture believes it has rendered useless. An installation view of the Chris Martin show at Michell-Innes & Nash with his large "Untitled" (2012) in the center. I would go further, and advance that you can believe that painting, like amanita muscara, is capable of opening up a space of ecstatic reflection, where you can step back from the madness of everyday life as well as consider it from another perspective. As an artist, you can shape the way time passes into a thing. If this thing is any good, it will acknowledge that individuals are also things at the mercy of time. Infinity and chaos await us all. Instead of seeking solace from time’s indifference by aligning yourself with a doctrine or a convention that denies its passing, you can elect to stare into the sun. As Martin’s paintings make amply evident, the visionary and the ecstatic are present in everyday life and therefore within anyone’s reach. Martin’s paintings are haunted by mortality, imparting an emotional edge to their visionary fervor. 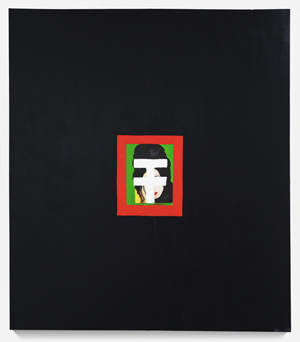 Over the past few years he has made a number of paintings and collages as “Protection[s] for Amy Winehouse.” In this exhibition he showed “RIP Amy Winehouse” (2011-12), a large black painting with a small portrait of the singer, with her signature beehive hairdo, in the painting’s center. An orange band frames the portrait, which is done a green ground. Over her face Martin has painted a white, two beamed cross. She is buried just beneath the painting’s surface. Sneaker prints are visible on the painting’s left side, as if someone walked up the front on the way to heaven. The sneaker prints are both capricious and an expression of that deep-seated human desire to defy gravity. It adds a touch of levity in the face of death. Martin accepts mortality, but in a way that is light, almost joyous. Knowing time is precious; he doesn’t waste any of it by lamenting that fact. His work isn’t filled with anxiety or doubt. However big his paintings might get, and he showed some more than twenty-five feet high at his first museum show at the Corcoran, they aren’t going to be about their labor. 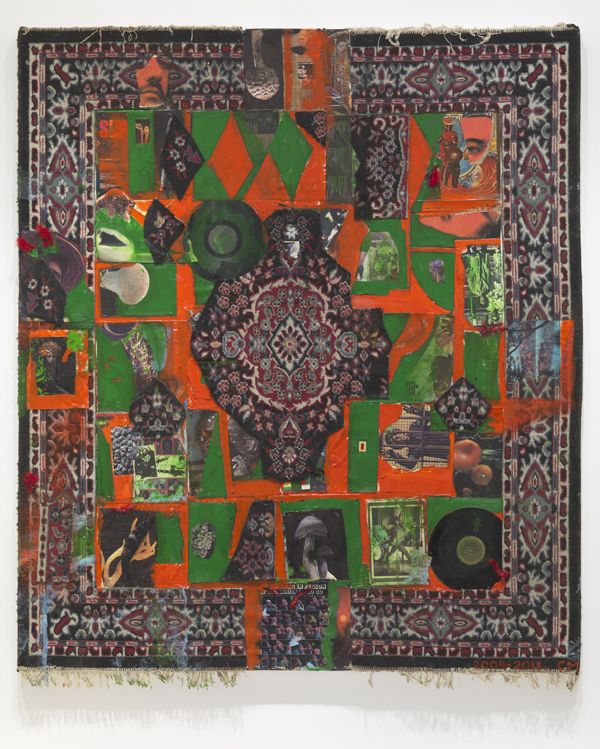 In “Magic Carpet” (2012), Martin uses a carpet that had been on the floor of his studio for years, as the ground upon which to paint and collage records and photocopied images of mushrooms. They are literally the figures in the carpet, the things we might see while daydreaming, hallucinating, or traveling out of our bodies. He wants the viewer to see that a painting is a magic carpet capable of transporting us to another state of seeing, at once inward and outward. Martin’s paintings do wake us up, if we let them. He has an implicit faith that we will be open to them. He doesn’t harangue or lecture us. If anything, these paintings are direct and heartfelt and, in that sense, naked. He is unafraid to be both visually ecstatic and prosaic in a single work. 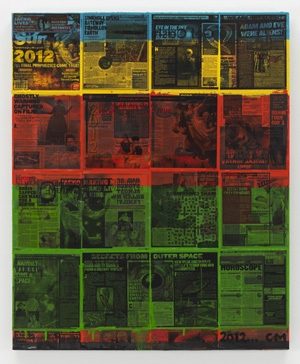 In “All Final Prophecies Come True” (2012), which is from Martin’s new series of paintings, the artist collaged a grid of newspapers to a canvas support. As with the other paintings in this series, the title comes from a headline, which is visible in the painting’s upper left hand corner. Other headlines we see in “All Final Prophecies Come True” include “Adam and Eve” and “Outer Space.” In other paintings in this series, the bold-faced headlines (ROBBED! And BUS MANIAC) convey the anxiety, perils and unanticipated eruptions of everyday life. Living in a wobbly time, and bombarded by messages of all kinds, we want a security that we will never obtain. To Martin’s credit, he doesn’t express the morbid fascination and creepily gleeful feelings of being a survivor that run through many of Warhol’s newspaper inspired paintings, such as “Tunafish Disaster” (1963). Over the headlines of “All Final Prophecies Come True,” the artist has painted horizontal bands of different widths in blue, red, and green. We keep refocusing our attention, shifting between seeing the colors and reading the headlines. Among other things, Martin’s newspaper paintings cleverly and effectively deflate the current hierarchy, which ranks conceptual art (and its emphasis on reading) above painting, which is equated with the visual and therefore dumbness. Some of the headlines that Martin has knowingly chosen can only be called dumb, while others are horrific and unsettling. Language, rather than the painting, is the ready-made. Moreover, not all reading, even that mandated by a museum, is enlightening. Martin’s newspaper paintings are the most succinct updating of the entanglement of reading and seeing since Jasper Johns’ “Flag” (1954-55). 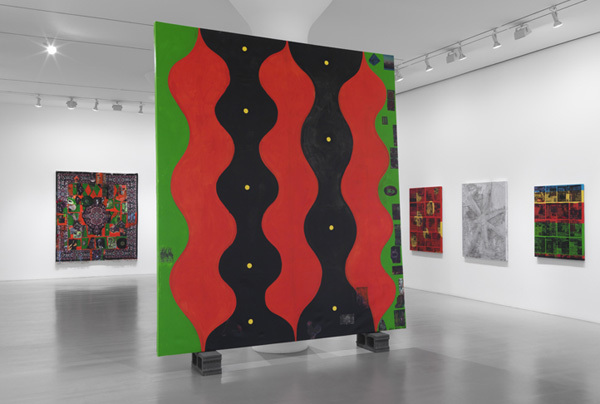 In the large painting “Untitled” (2012), which rests on two concrete blocks that prop it up against the gallery’s supporting column, Martin confronts us with the undulating columns of red and black flames of his visions. At the same time, the postcards and images he has collaged along the painting’s right side and bottom, and covered with a thin wash of color, invite us to move closer, to inspect these visual reminders of where he has been. In doing so, we learn that we don’t have to be afraid of the dancing flames. By again refocusing our attention, Martin reminds us that seeing is something that we are responsible for; that we have to want to see in order to do so. We have to pay attention to what is going on, but in the case of Martin’s paintings it never feels heavy or ponderous. That’s because he is speaking to us as if we are fellow travelers who happened to have stopped in this cul-de-sac presided over by a pipe-smoking gnome. It’s an underground meeting place right out in the open. Generosity and an air of community permeate Martin’s work. This, I would advance, is an aspect of the paintings that commodity culture cannot suture over. Chris Martin at Mitchell-Innes & Nash (534 W 26th Street, Chelsea, Manhattan) continues until March 3.